Like everyone, I’ve been listening to all the back and forth talk about the proposed trade between the Cavaliers and the Minnesota Timberwolves that would bring Kevin Love to Cleveland. Every permutation of the trade involved the Cav’s #1 draft pick Andrew Wiggins packaged with other players/draft picks. I’ve watched Wiggins play in Summer League. He was good – athletic, played defense, moved to the hoop, protected the rim. I believe he does have the potential to be great someday. Time will tell. Initially, I was torn by the looming trade. The press built up Wiggins tremendously. And, I had hopes that Anthony Bennett, last year’s #1 pick who bombed, would improve drastically. But, the more I’ve read about the players, the teams and the fit, and the longer I’ve thought about it, the more I’ve come to like love the proposed trade. Now that Yahoo! Sports reports that the trade (Wiggins, Bennett and the 1st round pick we acquired from Miami when Lebron left (HAH!)) is a done deal and will, I’m ecstatic. Honestly, I cannot imagine a better trade for the Cavs. I hope Wiggins is great. I hope Bennett is too. 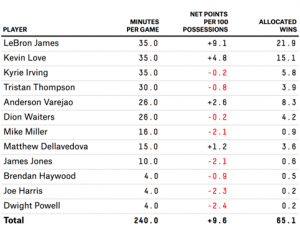 But, Kevin Love is great today. He is generally viewed as a top-10, possibly top-5 player in the league. Charles Barkley called him the best power forward in the game. In the end, what are we giving up? Not much. With Love, and Tristan Thompson backing him up, the loss of Bennett, who had a negative WARP last season, is near zero. Giving up [lottery protected] draft pick (one of three in next year’s draft) on a team loaded with talent and youth costs little. So, we’re mostly trading Wiggins, an untested rookie with potential for Love, a perennial All-Star. How can that be anything other than great? I also love that the trade seems to cement Dion Waiter’s (my favorite Cav prior to Lebron’s return) spot on the roster. I have great faith that Lebron’s leadership and, from what I’ve read, David Blatt’s coaching skills, and our vastly increased win count will create on-court and locker room harmony. Look at Kevin Love’s stats over the past three season’s played (culled from an ESPN post). Note, Love did not play in 2012-2013 due to injury. These are phenomenal numbers. Some people view Love as a stat padder, the one good player on a bad Timberwolves team. Advanced metrics show that is not the case such as ESPN RPM (real +/-). The Twolves were a much better team with Love on the court than off. Lebron is the best player in the game, bar none. Kevin Love is possibly the best power forward in the game. Kyrie Irving is one of the top point guards in the game. The Cavs’ 2013-2014 Big 3 will be better than the Miami Big 3 were during any of Lebron’s years in Miami. The Cavs have also acquired talent to complement Lebron. With the additions of Mike Miller and James Jones, the Cavs now have 2 of the top 5 3-point shooters in the league last year. They will give the Cavs spacing, which will open up the lanes for Lebron and our other drivers. We will also be a great rebounding team. Love was one of the top defensive rebounders in the league last year. Tristan Thompson was a leading offensive rebounder and every Cavs’ fan knows the boundless energy Anderson Varejao brings to the glass. Another factor is how much Lebron elevates the game of everyone around him. 538.com did an excellent job of capturing this analytically in this article. Here’s a peek at the key findings from 538. They show that everyone on the Cavs got worse when Lebron left. Everyone on the Heat got better when he arrived. The addition of Love elevates the team to frontrunner status. Here’s more analysis from 538.com quantifying what he’s worth to the team in terms of wins. 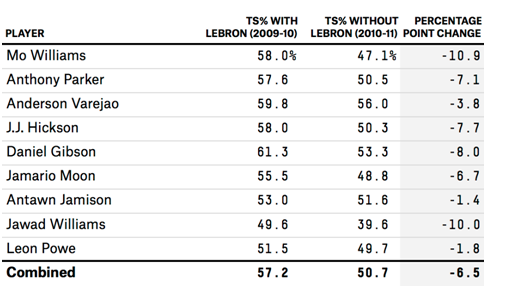 With Lebron, but without Love, 538’s model projected a win total in the mid-50’s, which equated to a 5% chance to win the trophy. A team with 65 wins has a 60% of winning it all. That’s progress. Every Cleveland fan is starved for a championship. The Cav’s roster for the coming season is shaping up to give us the best shot at bringing home a trophy in decades. I can’t watch to see what they do! This entry was posted in From Chris by ChrisG. Bookmark the permalink.